You can thank enslaved Africans for one of America's most iconic drinks: Coca-Cola. “The base ingredient in Coca-Cola is the kola nut that’s indigenous to Africa," says Frederick Opie, professor of history and foodways at Babson College in Wellesley, Massachusetts, and the author of several books, including "Hog and Hominy: Soul Food from Africa to America." Since the 17th century, when Africans were forced into slavery in the New World, they and their descendants have had a profound impact on what Americans grow and eat. Watermelon, okra, yams, black-eyed peas and some peppers are all indigenous to Africa. “If you know what people eat, you can find out where they’re from," Opie says. "There are certain things that we crave. Many African Americans love spicy food. That’s because we’re from the South. But also, we come originally from a culture, from a hot tropical climate, and spicy foods create a gastrointestinal sweating that causes you to cool yourself. So, that’s why so many African Americans love spicy food." Hercules, George Washington's head cook in the 1780s, escaped while in Philadelphia with the president, and was later freed under the terms of Washington's will. There was a practical reason indigenous African foods made it to the New World. Fruits and vegetables brought from Africa flourished in America in large part because enslaved Africans planted their own gardens to supplement the meager rations provided by their captors. 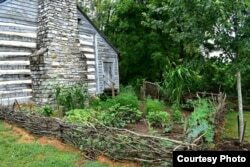 These plants eventually made their way from gardens of the enslaved to those of some of the wealthiest and most prominent people in the country, including George Washington and Thomas Jefferson, whose gardens were planted with heirloom seeds from Africa. 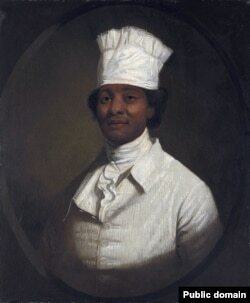 Enslaved African chefs left their mark on certain cooking methods, while also developing recipes that are now staples in the American diet, particularly in the American South. "Dishes like gumbo, jambalaya, pepper pot, the method of cooking greens — Hoppin' John (a dish made with greens and pork)," Kelley Deetz, director of programming at Stratford Hall, told VOA via email. Stratford Hall is the birthplace and family home of Robert E. Lee, general of the South's Confederate Army during the Civil War. The kitchen building on the Chicora Wood Plantation in Georgetown County, South Carolina. "The method of deep frying of fish or barbecuing meats were all documented in West Africa before the transatlantic slave trade," says Deetz, who is also the author of "Bound to the Fire," which explores how Virginia's enslaved cooks helped invent American cuisine. "These dishes and ingredients were essential to the formation of Southern, and eventually American, food." Many of these foods with roots in African American culture eventually came to be known as "soul food." “Soul food is just a term that was coined during the Black Power movement of mid-to-late 1960s as a way of identifying a food that represented the heritage of African Americans," Opie says. "But also, through the years, it is food that African Americans began to create a long time ago to eat with dignity as enslaved people in (the) diaspora." Cooking a fried supper as a benefit picnic church supper in Bardstown, Kentucky, in August of 1940. 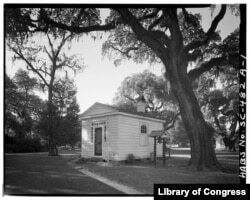 For more than 200 years, Southern plantation owners relied on enslaved Africans and their descendants to work in their fields and houses, to help raise their children, and to provide food and drink. 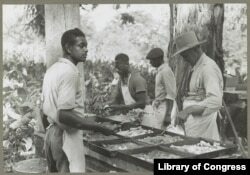 But the contributions African Americans have made to American cuisine have not been well-documented until more recently. Deetz says that's because there's been a longstanding and intentional misrepresentation of the origins of southern cuisine. "The skilled and talented black chef has been written out of our nation’s history," she says. "This negligence gives way to racist narratives that support white supremacist ideology that enslaved Africans and African Americans brought little but their labor to this nation, and that the culture from their ancestral land has not made a positive impact on the United States. ... It was both their labor and their talent that shaped American cuisine."